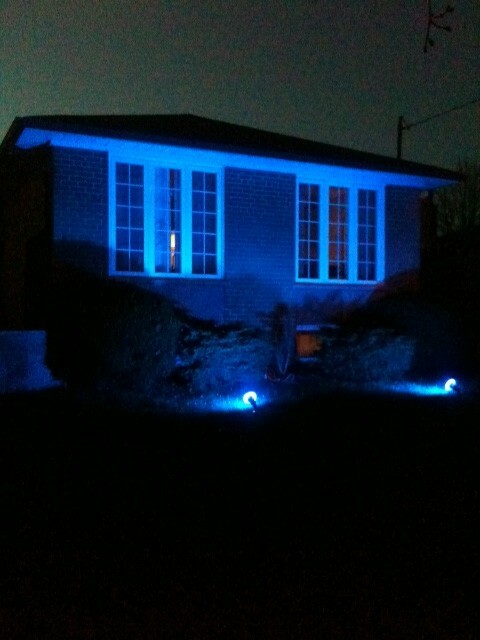 As I came home last night and approached our house, the shining blue spotlights clearly made a statement. I love that we chose to do this as a way of showing our support for World Autism Awareness Day. It demonstrated part of our commitment in raising awareness for Autism but in my mind, also made me keenly aware of how different we are from our neighbours. As they went on with their nightly activities, I came home…poured a drink…cuddled into my husband and had a good cry. I was so overwhelmed by yesterday. Throughout the day, I felt incredibly proud of how people in the world were coming together on one singular day to raise as much awareness as possible. It seemed every store I had stopped into recently- Toys R Us, Home Depot- there was a message about raising awareness. The Autism Speaks website had an incredible amount of shots of structures around the world Lighting It Up Blue in support. Amazing. I found myself reading a ton of blogs, following a number of streams on Twitter, posted on Facebook, and received messages of support via email, direct message and posts on my walls from friends who generously reached out to make their statement about Autism. My heart hurt with how many people wrote honestly and with raw truth on what it feels to be a parent with a child with special needs. The one that hit the nail on the head was 7 Things You Don’t Know About a Special Needs Parent. I appreciated so much what Maria Lin wrote in terms of the feelings you have as a parent in this situation. I feel like the cog in the awareness wheel is finally starting to move a little bit. That people are more and more aware of Autism (and an increasing number of kids are getting diagnosed with some form of ASD) but they still don’t really understand it. No one really does. Now I find part of me is filled with an unruly amount of impatience. I want to do something. I want to fix something. I want to see change. I keep thinking we need to look at things just a little bit differently..to better understand Autism and how it works, we could come up with stronger answers on how to help them manage through the key challenges they have in daily life. I used the example to my husband of one of those 3D puzzles you have in the paper. Looking at it, its just a series of spots..but if you let your eyes relax, suddenly you see an entire picture that wasn’t there a second ago. I am trying to relax… my eyes…just a little bit more. ← Light it Up Blue!